Assembly of the figures is a bit daunting at first, but I was able to assemble two squads in about 2 hours. I did not pin them (I wish I had a small enough bit), but I may have to in the future. Lets see how the glue holds up. 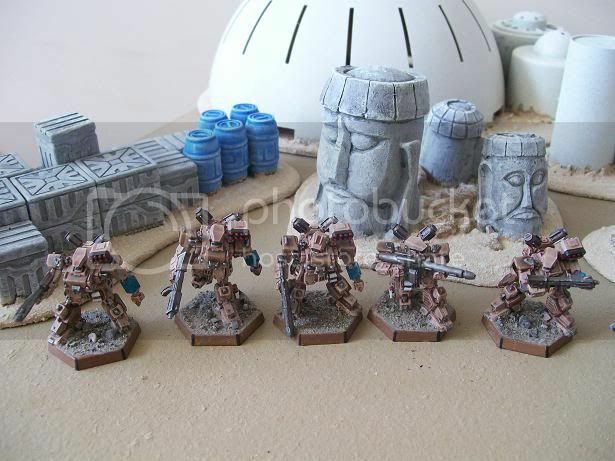 It is best to read through the rulebook and use the free force generator called Gear Garage https://www.assembla.com/spaces/GearGarage/documents before you start assembling your squads. 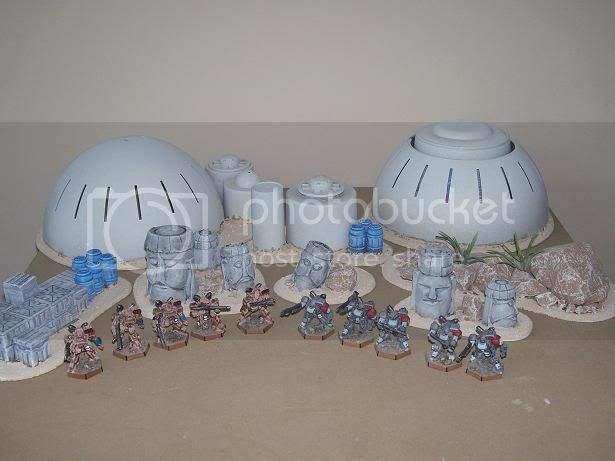 Next I have to build a 4'x3' demo table and paint the figures. The Rules are 22 pages long (yup thats it! ), are very indepth and actually involve hi tech warfare concepts like Electronic Warfare, Sensors, Forward Observation and Communications. The book also includes 18 pages of Scenario, campaign, league play and tournament rules. 200+ pages, well designed and illustrated. 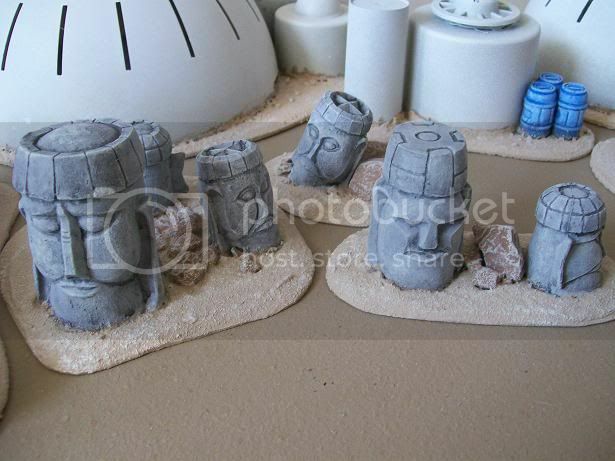 Fixed the sand colour on the terrain. I have to duplicate it on the gears. Almost done the demo terrain. I have 4 hills yet to finish, portable table, palm trees and decals yet to add. That looks great! I look forward to trying out some demo games. Cool minis. IMHO just a bit plain. How about some markings like crosshairs, text or other signs on the parts. 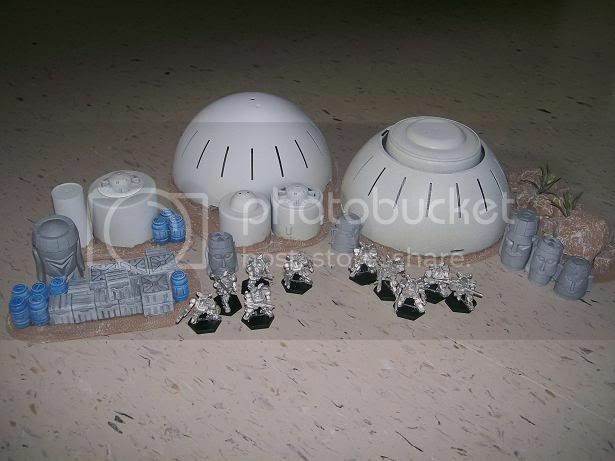 The pics of the gears I posted are of the 'Grunt' type. 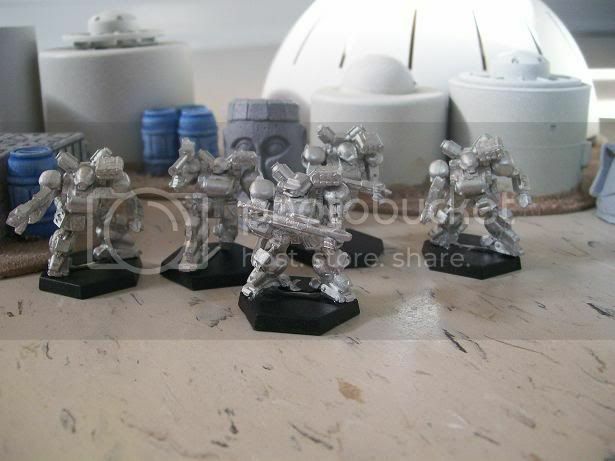 Yes, very plain, but they are intended to teach the mechanics of the game (ie Space Marines vs Ork boys). The game gets much more interesting when you incorporate fire support, infantry, tanks and Electronic warfare units. The cool gears are the recon, heavy, elite and striders IMHO. Here are a few pics from the DP9 website of the 'Cooler' gears. Check out their website for a full gallery of all their products. Demo games will begin next week at the MWG Club (Battle report included). Check back for more details. The cool ones are sorta hit or miss imo, the first and 3rd are by far the best...The second looks rather derpity. the red bull is one of the first guys i want out of these. man please do some vids! 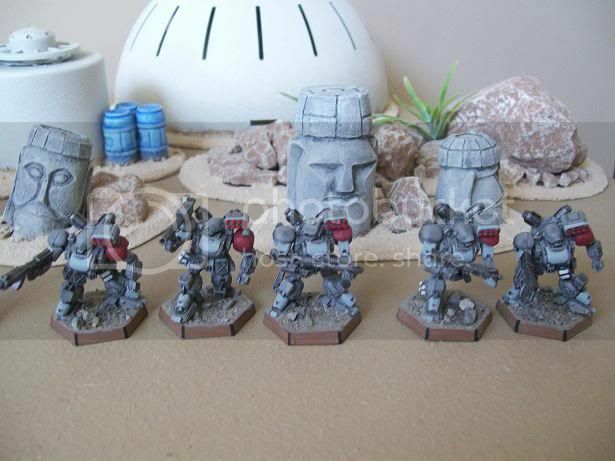 Fireman Tim wrote: Demo games will begin next week at the MWG Club (Battle report included). Check back for more details. Cant wait to hear what you guys think of it. I have read through the rules about 3 times now. There are lots of new tactical concepts that I have not played with in a while (ie concealment, forward observation, indirect fire, combat lock (which is really just a more in depth way of calculating line of site), active lock (using radar and sensors to detect targets), guided munitions, target designators. The game mechanics are really not that complex, its just a matter of retraining the mind (from years of 40k). 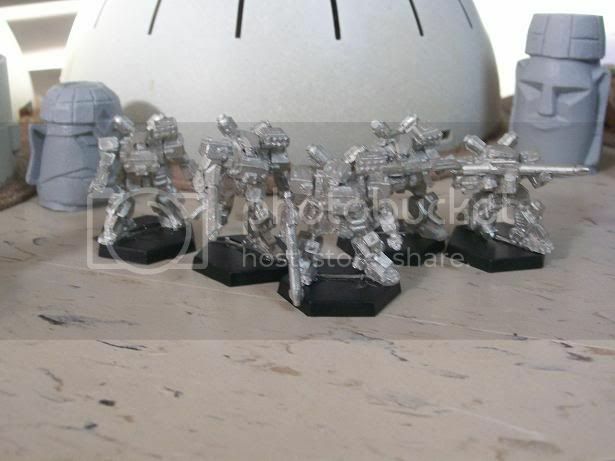 They have a real sci-fi feel, like you are fighting with advanced weaponry. The damage rules are great. I love it that accurate shots (Margin of success) will multiply the damage you inflict . The rules I really like are the electronic warfare (sounds boring, but its not). Jamming and counter jamming communications, preventing forward observing and blocking the use of command points. 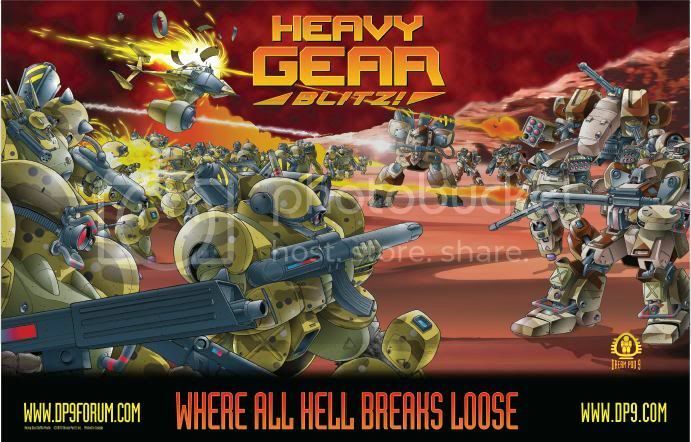 I will be running demo games of Heavy Gear Blitz on Saturday Dec 4th from 12pm to 2pm. Sci-Fi Mecha combat at its best! Will you be making a video? I'm very interested in this game. Yes, I'll try and make a video. Pics definately.